Not only are The Pähni Megaphones visually stunning, but the simple idea behind the installation is also equally beautiful: the forest is essentially a sound library, with hundreds of different “records” to listen to, each one truly unique in their elegance and artistry. “Film music should have the same relationship to the film drama that somebody’s piano playing in my living room has on the book I am reading,” Russian-born composer Igor Stravinsky once famously said. The mark of a great movie score is that you mostly don’t notice it as a separate entity, but instead take it in as a seamless part of the visual experience. As far as I’m concerned, this very element has the potential to separate good movies from great ones. If you’re looking to improve the quality of your score or set, getting up close and personal with a natural soundscape is a great idea — and Estonia’s Pähni Megaphones make the perfect landmark for your next film or recording. 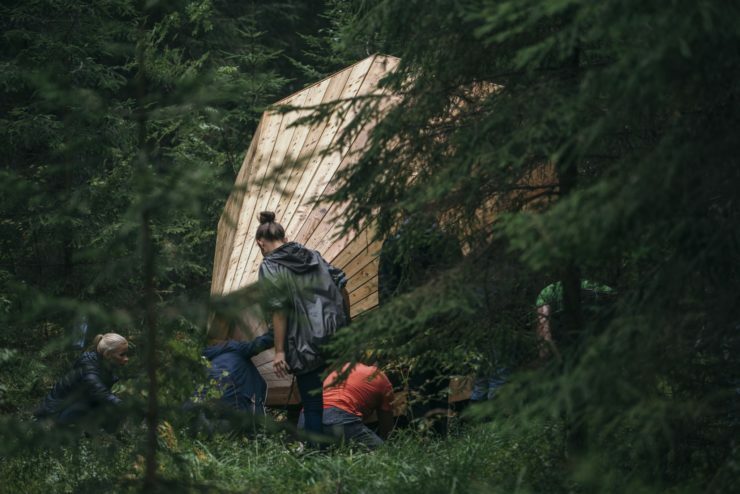 The three colossal wooden megaphones rest on the in Voru County forest floor in by the RMK Pähni Nature Centre in southeastern Estonia. 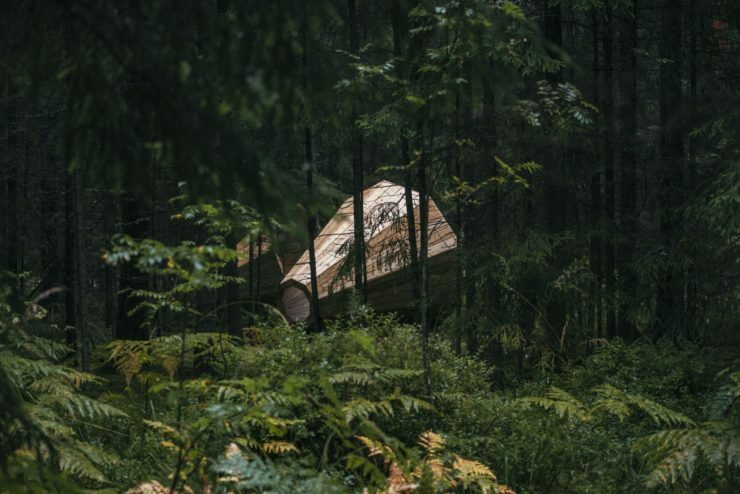 Each with a diameter of almost 10 feet, the gigantic wooden cylindrical structures sit in a clearing where they are meant to naturally amplify the sounds of the forest. The megaphones look like gramophones from old war documentaries but are almost a hundred times bigger than the iconic “Victor Talking Machines” made famous via the His Master’s Voice (HMV) logo. The art project, called “RUUPS,” is the brainchild of Birgit Õigus, an Estonian stylist. After she came up with the idea, she took it to Avo Tragel, the Head of the wood workshop of Estonian Academy of Arts. He supervised the whole project, which was then carried out by first-year interior architecture students from the Estonian Academy of Arts. When you get to the site, you can peer through each of the structures for unique framing and audio experiences. And standing in the middle of each megaphone offers a unique multi-dimensional soundscape, perfect for adding some depth to a nature scene or even being as an arty visual backdrop. Not only are the results visually stunning, but the simple idea behind the installation is also equally beautiful: the forest is essentially a sound library, with hundreds of different “records” to listen to, each one truly unique in their elegance and artistry. If you’re scouting Estonia, getting so far away from civilization is not only a vital part of rest and relaxation — it could also easily lead you to new movie inspiration and adventures. Whatever happens, just listening to this electrified flora and fauna stereo soundscape is certainly a healing experience. You have to see and hear the Pähni Megaphones to truly appreciate their beauty. So if you’re looking for an unusual nature locale or score to add to your next film, and you’re interested in a 30 percent cash rebate on eligible production costs, a visit to Estonia will be a win-win!